In a way his life’s story reads like a novel. For how often do you come across a teacher-turned- driver blossom into a Sahitya Akademi Award-winning writer. But well-known novelist Baldev Singh Sadaknama’s tale may be the stuff dreams are made of, his writing is no flight of fancy. On the contrary, it is steeped in years of research and study. The Moga-based writer, who was in Chandigarh for a Lohri function organised by Sunday Indian, confesses, "Only 10 per cent of what I write is fictional." Why his very first piece of writing stemmed from personal experience itself. The man who has worked as a driver of a truck for 10 long years was privy to a world that outsiders can neither relate to nor understand. Says he, "By and large people think that drivers are uncouth, illiterate people and few realise the insecurity, physical and temporal, that defines their lives." Interestingly, what started as a stray article for Amrita Pritam’s literary magazine Nagmani soon became a serialised column by the name of Sadaknaama, which later was published in book form as well. Not only did the readers lap it up they began to associate the word sadaknaama with his very being and, presto, much to his surprise the word was affixed to his name by his fans. Till date, the author who has penned over 55 books, has not been able to brush off the sobriquet. Novels, plays, short stories`85 much has flown from the ink in his pen. As many of his plays like Mitti Rudan Kare have been staged time and again over 400 times by Punjabi University, Patiala, he feels that nothing can beat the high of watching a thousand plus audience respond to your play. In comparison, the novel is a slower exercise, but no less fulfilling. He brushes aside the suggestion that not many significant novels are being written in Punjabi. He observes, "Punjabi novels are very popular among readers." He has written several which have found a vast readership as well as recognition. 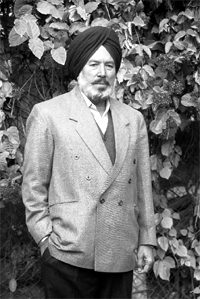 His novel Anndaata, detailing the plight of farmers is part of the Guru Nanak dev University and Punjabi University, Patiala syllabus. Lal Batti, a close look at the lives of prostitutes, has even been translated into Hindi as also been printed in the Shahmukhi script. For Lal Batti, he studied the lives of those involved in the flesh trade for nearly a decade. In the process, he even earned ignominy but it was worth the final result. Whether his subjects are people from everyday life or buried in the labyrinths of history books, his sympathy lies with those who have not been heard before like Bhai Jaita. With equal ease, he moves from contemporary concerns to history. More recently he has written one on Dullha Bhatti, titled Dhawaa Dilli De Kingre, that has won him the prestigious Sahitya Akademi award. On the recognition, he observes, "It feels good but I sincerely believe if you do your work with honesty, awards and fame will find you." He doesn’t think Dhawaa Dilli De Kingre is his best work, "Anndaata was more deserving.,"he says. He is writing a sequel to Anndaata as well as to Lal Batti. The writer, whose novels are open-ended, was overwhelmed by the curiosity of his readers who wanted to know the fate of some key characters. On his characters, he says, "Each character, howsoever minor, is very special and one has to internalise their experiences and feelings before making them come alive on the paper." In his literary world, there is little room for manipulation. Others can write from the comfort of air-conditioned homes, he operates from ground zero. Observing life unfold, he never desists from stating it the way it is.